In association with Shopify, the highly acknowledged, trusted, and institutive e-commerce platform, SAAS based T-shirt Designer Tool has been introduced . SAAS based T-shirt Designer tool comes packed with the advanced features, such as responsive options, print-ready format and many more. All these features can empower print based e-commerce stores with an advanced capability that can lead to the prolific growth of the business. 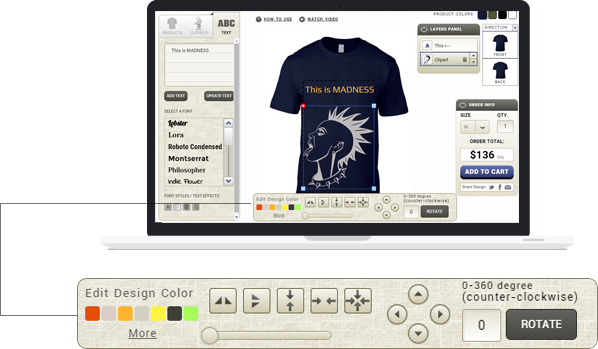 In order to access this T-shirt designer tool, the subscribers have to pay only $15 per month. And, the most important thing is, it is available for “Trial Period of 5 Days” and No Installation or Setup Fees will be charged. What if you get a chance of purchasing this designer tool App by paying just once. Yes!! You heard it right. We, at No-Refresh believe to attain complete contentment of our clients from all across the world by accomplishing all possible requirements from their end. Now, the business owners can get this designer tool app by making one-time payment and enjoy all the benefits without any hassle. Note – Hosting of the software will be on our own Server. Bestowed with advanced functions, SAAS based T-shirt Designer Tool enables the end-users to make their creative ideas alive. Willing To Bring Transformation To Your Print Business? Give It A Try! Rotate the text and image clockwise or anti-clockwise or change the color of the product .